FIVE pages of Rules?! You must be crazy and this barn is STRICT! Nope. Relax. They’re common sense things people usually do anyway. I need to get these out there for my insurance company to be happy. You need to be well informed on what you’re getting into. Seriously, these rules are only common sense. What I ask is, above all, you give me the benefit of the doubt. If you see something questionable, most likely it is because I didn’t see it or someone went ahead and did something I would not have chosen to do. Please alert me to any “situation” immediately. Don’t be worried by the length of the rules. We’re just here having fun, and though it seems annoying, it’s better to be safe than sorry when it comes to keeping your horse happy, healthy, and safe. I take every precaution I can to keep you and your horse happy. It’s my job, and I love it each and every day. Currently there are no specific/set hours for the barn and arena. Please be respectful when choosing riding times and activities around the farm. There is no smoking, drinking any form of Alcohol, or drug use in and around the barn. If you are found to be under the influence and you arrive at the barn, you will be asked to leave. You will have 24 hours to remove your horse and your personal items. We interview all boarders before accepting people into our barn. If you choose not to wear a helmet, you will be asked to wear a helmet. If this is a consistent problem, you will be asked to leave. Be safe and take care of those around you. If you see a dangerous situation, please alert Sarah. Any accident or injury to a person or horse must be reported immediately to Sarah, and an accident report must be filled out. Halters are to be removed from horses unless there are special circumstances. No running or screaming in the barn or around the barn unless it is an emergency. Guests, children, and dogs are not allowed in pastures. Well behaved dogs are welcome, but aggressive dogs will be asked to leave. Any dog that bites is immediately banned from the farm. Do not climb on fences or gates. If you notice any loose fencing or broken areas, please tell Sarah immediately. Please turn off lights AND HEATERS when you are done using them. Please park on the grass under the trees leading to and from the barn. Do not block the circle driveway. Keep all gates and doors closed when not in use. This includes the gate across the driveway—please close it after you drive through. This gate is to remain closed at all times. If something is not yours, DO NOT touch it. Ever. This includes horses and tack. Our neighbors may allow special access to their land–and it is up to you to speak to them if you wish to ride off Firefly Farm’s property. The land across the street, MSU’s Forestry Area, is only accessible through speaking with its guardians, Denise or Randy. Their phone numbers are posted in the tack room. You MUST speak to them and get permission in order to ride across the street. It is not up to Firefly Farm to get permission for you. If you, your horse, or your guests break something on the farm, please tell Sarah. We will come up with a plan to fix or replace it. If it is an easy fix, please fix it yourself—then tell Sarah. We reserve the right to charge for any damages your horse might cause to our facilities (stall, barn, fencing, arena, etc). Normal wear and tear is acceptable. Share the barn. Please clean up after yourself and anyone who is with you. Help each other. Please return your horse to wherever you got them from unless asked to do otherwise by Sarah. Return all tack to the appropriate areas, as all tack found in the aisle or arena will be subject to “random movements.” This means that it will not be where you expect it to be for the next time you ride. Wear appropriate clothing when you work with the horses. Closed toe shoes are required and long pants are preferred. Please be careful when turning your horse out in the pasture. Close the gate behind you fully before attempting to release your horse. Always, always double check every lock and gate to make certain they are shut and locked. Please clean up after yourself in the arena. If the bucket is full, please place the full bucket on the cart in front of the barn. If you see something you feel is dangerous, please contact Sarah immediately. If it is questionable, it is not approved behavior. Do not coach other people in the barn. There is only one insured instructor at this facility, and we don’t want accidents. Do not adjust the heat in the tack room. It gets hot in there very quickly, but is drafty. The heat will be on enough so the pipes don’t freeze. No climbing on the hay bales! If you wish to sit on a hay bale, feel free to pull one off the pile, but do not climb on the stack. It is a liability issue—we want everyone to stay safe. Please remember above all that this is my home. My back yard is not a pasture—do not release horses there to graze. Guests are welcome, but do not “borrow” a horse for this person to ride. If you wish to allow a guest to ride, it must be discussed with Sarah and a release form filled out before any riding may occur. Prospective riders need to have a release of liability form filled out. We have extras hanging on the wall on a bright green clipboard in the hallway of the barn. Groom horses in the cross ties, stalls, or indoor arena. If there is a lesson at the time you wish to tack up, please use a stall or the cross ties. Please clean up manure and hair from the floor before you ride. The aisle should be swept before you leave. We do NOT use a leaf blower to clean the aisles, as the dust is bad for horses to breathe in—it’s also bad for your lungs, too. Horses should NOT be tied to the bars of stalls. They need to be tied to corner posts, cross ties, or left loose (stalls only.) Never tie your horse with reins, a chain over the nose, with bailing twine or any other non-rope, non-clip item. This is for safety purposes. While riding, it is expected that you wear a helmet. If you do not wear a helmet, you will be given a warning to put on the helmet. Anyone who disobeys this request will be given 24 hours to vacate the premises—yeah, you’ll be asked to leave and you won’t be welcome to return. This also goes for posting non-helmeted photos online (Facebook or other social media.) If I see a photo of you online at our barn, you’re given one warning. That’s it. Please share well with others. Do NOT race around the arena. We are not a speed barn. Be polite. If there is a lesson, please follow their flow of traffic. You’re welcome to ride in the indoor arena during a lesson, but please be kind and do not interfere. Be respectful during lessons. Please do not turn your horse loose in the arena unattended for any reason. You may free lunge in the arena as long as nobody is trying to work in there. Jumps, poles, barrels and other equipment may be used, but they are to be removed completely from the arena when you are finished. There will be NO RIDING on barn aisles or ANY concrete area at Firefly Farm. This includes the driveway. Please mount outside near the RAMM fence if you’re going to the outdoor arena. Do not ride through pastures if any loose horse is present. You may ride in an empty pasture, but get permission first. Also, beware of mole and groundhog holes. When riding, please stop your horse if someone is having trouble with their mount. Only continue after the horse is under control. We will not be responsible for any fines and/or prosecution if you trespass on posted or non-posted property. When riding outside October to January, we recommend wearing something that is hunter orange, so that you and your horse may be seen. Horses should be properly cooled down and groomed after riding. Children are to be supervised at all times. Children are NEVER to be dropped off to spend time with the horses unless they have scheduled a lesson. I will attempt to call you for ½ hour in the case of an emergency. If I cannot reach you, I will still call the vet. Please see the separate form to discuss how this works. If something is causing your horse pain, discuss this immediately with Sarah. We may work out a stall rest schedule, or figure out a way to separate your horse to keep him or her quiet. There are Daily Check and Vital sign pages in the tack room. Please fill one out for your horse if your horse is not feeling well or seems down. That, and your phone call, will alert Sarah that there’s a situation with your horse. The horses here are insured to $5,000, however, you should check with Darrin (Sarah’s husband) for further insurance information. Horses must be current on vaccinations and deworming. A Coggins test is only necessary if you remove the horse from Firefly and return later. If you have a Coggins, however, please file it with me. This is true, too, if you have papers for your horse. I simply ask for a copy of them—NOT the original documents–it doesn’t even have to be a color copy. It is very important that all information I can gather about your horse is available to me. You never know when it’ll come in handy. If an accident happens, and someone falls off, do not move them or remove their helmet. If the person chooses to rise, that is their choice. If the person is unable to speak, is in a lot of pain, or incoherent, please call 911 immediately. Please call Sarah or come knock on the door to the house to tell Sarah what happened. An accident report must be filled out. The farm Is just south of the freeway overpass on Hagadorn. Please do not bring more than two saddles and two bridles to the barn. You will be given a spot on the saddle racks to put your equipment, and we want to make room for everyone. Grooming equipment must be kept in a container (Rubbermaid style), bucket, or tack box. Saddles, pads, bridles, and helmets are allowed in the tack room. All other horse equipment must be placed in the indoor arena. Make sure all of your tack and equipment is covered under your home owners and renter’s insurance. We are not responsible for lost, damaged, or stolen items. If you have found something that is not yours, please move it to the indoor arena and place it (saddles) on an empty rack, or in an easy-to-spot location. Please hang your halter and lead rope up on the hook near your horse’s stall OR in the designated area. We don’t want to lose it. It is best to have your halter labeled. Please do not borrow something that isn’t yours. If you walk somewhere, sweep that area after you’re done. If you take something that is not yours (stealing), you will be given 24 hours to leave the barn AND will be asked to return the stolen object. Sarah is on site about 90% of the time. If you don’t see her, go up to the house and knock at the front door. If Bandit’s home, Sarah may be home. If Bandit is gone, Sarah’s gone. Feel free to email me at RideFireflyfarm@hotmail.com, or friend me on Facebook, RideFireflyFarm. We have a chalk board by the bathing area and we have two white boards with calendars on them, telling boarders about lessons. If you have a concern with the facility or safety of a horse, alert Sarah immediately. If you have a problem with someone or something, please see Sarah. Do not complain to other boarders. We are a no-drama barn, and when you complain to others, Sarah ALWAYS hears about it. 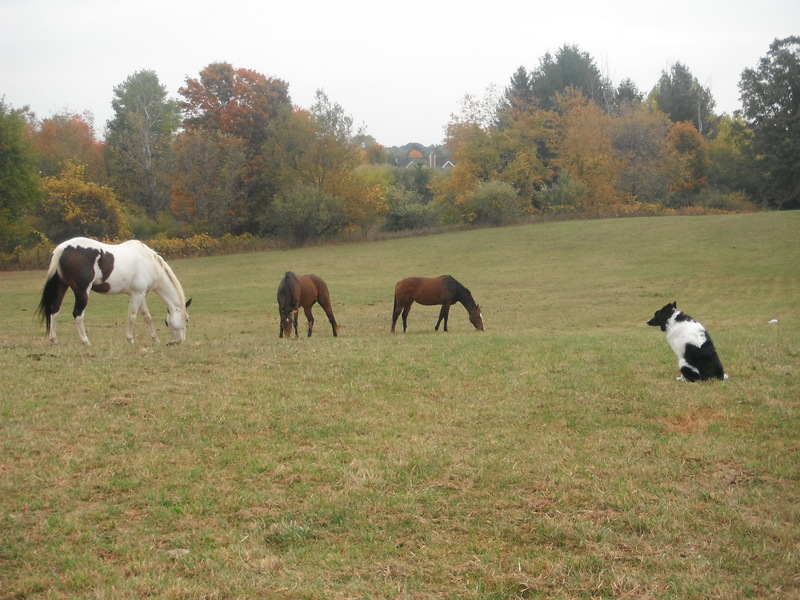 If you’d like to stay at Firefly Farm, you’ll refrain from gossip of ANY kind. Sarah ALWAYS hears about it! You must keep up to date with your address, telephone number or email changes for yourself and your emergency contacts. This is critical in an emergency. If you’d like to have your horse kept inside for some reason, please see Sarah. We can arrange something. Please fill out a Daily Check and Vital Signs form, call or talk to Sarah, and leave your horse in a stall with Hay and Water. Do not leave manure, hair, or debris in the aisle. Sweep it up. Keep the wash rack clear of dirt, too. DO NOT sweep ANYTHING into the wash rack drain. Clean up everything solid before it goes down the drain. We do not want a clogged drain. Bathe your horse in the wash areas only. If you would like to bathe your horse outside, there is a very nice place just on the other side of the wash rack in the triangular grassy area. Though we have a heated wash rack, we do not recommend bathing your horse during the winter months. Horses will be fed hay and grain twice daily. If your horse is thin, we may arrange to feed lunch, also. This will be done at no extra charge if I can see ribs on your horse. If I don’t see ribs on your horse, I feel there is no need to feed lunch. In the instance you expect lunch to be fed to your horse, it is an extra charge. Pastured horses will be fed grain and hay twice daily. On especially cold days, I may give them extra hay in the middle of the day. We provide plugs for heated water buckets. Please provide a heated water bucket for your horse’s stall. We understand that cash flow can affect extras for your horse. We always place two water buckets in every stall during the summer, and you’re allowed up to two heated buckets over the winter. We do not want horses to colic because they drank all their water early in the evening and went without water the rest of the night. Owner supplied supplements will be fed for no additional charge, but must be placed into a container like those currently found in the feed room for Smartpaks. Please label the containers with your horse’s name and whether they are AM, PM or split dose. We recommend you feed treats out of buckets. If you don’t, they’re your fingers and they become your responsibility. We’re warning you now. Fingers and carrots seem very similar to ponies. DO NOT give feed to any horse. If you want to give your horse a bran mash with a cup of oatmeal and a cup of grain, that’s wonderful. We encourage you to give your horse fun treats. However, we do not want you to feed any large amounts of grain to your horse (over 3 cups or 1/3 of a quart)–we simply want to prevent colic. If you feel your horse isn’t getting enough food, speak to Sarah immediately. We never want to see any ribs on any of our horses, and sometimes it’s easy to overlook something small in someone else’s horse when it is a large issue to the horseowner. I have received a copy of Firefly Farm’s rules and regulations. I have read and completely understand the rules and regulations that Firefly Farm has given me. I will follow them, and I will make sure that any of my guests or invitees follow them also. I will be responsible for my guests at all times, and will be responsible if my guests do not obey the rules. Hi, it’s Jessica. Idk if you remember me but we emailed about a month ago about about my possibly boarding there. It’ll still be another month or so before I decide to move them or not, but I was actually wondering if I could do some volunteering for you guys. I love to help out, especially with horses, and it’ll give me a chance to get to know you guys and see what the farm is like. I’d love to help in anyway-cleaning, working with horses, giving lessons, you name it! You’re more than welcome to volunteer here, however, our barn has filled up and there are no more boarder slots open. Sorry! Let me know if you still want to volunteer. Hello, my name is Autumn. I am interested in working/volunteering at your stables. I have 5 years of horse experience. I am very confident when it comes to working with these beautiful animals. I can do anything from, cleaning, grooming, feeding, exercising, giving lessons, trail-riding, anything just name it. I will be free for most of the summer so if you’re interested I will be all yours! Please get back to me.